Basic design and impact modules that provide a wide variety of compositions suitable for all tastes and needs. Availability versatile, especially designed for modern taste that closely follows the latest trends. Functionality and hospitality: these are the characteristics of Ak_Gallery, a dynamic environment lived in the hands of practicality and comfort. The key feature of Ak_Gallery is the frame door, available in matt lacquer version and in the exclusive oxidized lacquer finish. The 22 mm thick door can be matched with all the plain doors available in Ak_Project collection. Extremely flexible in terms of modularity, enriched with “XL” cabinetry to fit American appliances. A unique, modern, design-focused setting, in which the kitchen is the heart of household activities. The island units can be fitted with large accessorised drawers measuring 150 cm with a single front panel. The cantilever bench top in Tavolato Ardesia oak turns the island into a functional space for preparing meals and breakfast. The tall cabinets house fitted electrical appliances measuring 76,2 cm (30”). Design and practicality have led towards a new design objective. Various aesthetic and practical solutions, brought together in a single collection that harmoniously combines objectives and materials. The broad range of available finishes and the selection of modular systems ensures kitchen designs are tailor-made to suit user needs. The same project can be adapted to all finishes, without needing any substantial changes. The multiple opening solutions have each been designed to satisfy practical, ergonomic and aesthetic needs. AK_04 is a contemporary project that combines flexibility of composition, technology and new materials. The doors with an aluminum frame, lightweight and solid with wide availability of finishes. From PaperStone®, ecological and recyclable product until Fenix ​​Ntm®, material new generation, treatment with nano technology, which makes the surface extremely compact and effective idrorepelente soft-touch, among many other new materials. Specifications: doors 4 or 6 mm. Finishing: PaperStone®, Fenix ​​Ntm®, Corian, Old Oak, fiammato, Termicotto Rovere, crystal gloss and satin, gloss and matt lacquered. 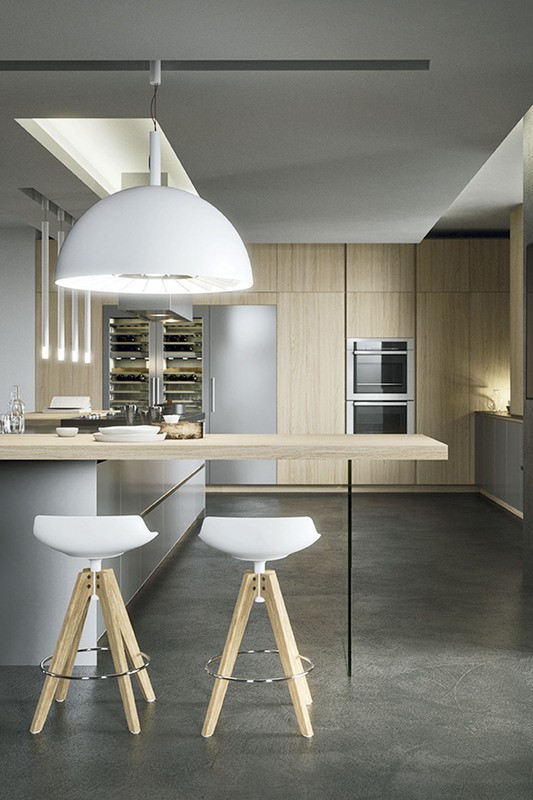 The kitchen is transformed and is available in various forms of opening doors: cuts at 30 °, doors with lacquered the same color as the front so that it is fully integrated or with new system hidden screws. Different solutions that come from the hand of a range of selected materials manage to create different aesthetic and tactile impact. Specifications: Doors in different finishes, 26 mm thick doors. 7 woods “spazzolato” 7 microcements, 4 textured glass and full range of lacquered finishes and sand Ral colours scale.